The first 10 days of February have been mostly cloudy, with intermittent light rain showers. Monday will be no different, but after a cold front sweeps through Houston tonight, we should finally have a stretch of drier weather, with several days of partly to mostly sunny skies. The coming weekend, for a change, also looks quite nice in terms of temperatures and sunshine. In advance of the front, muggy and warm air is holding sway, and because of this we’re again seeing some areas of fog where this warmer air is moving over cooler waters. Skies again today will be cloudy, with scattered, light showers during the daytime. Rain chances improve later this afternoon and during the evening hours, as low pressure ahead of the cold front moves into Houston. Accumulations likely will be highest near the coast, where there is the most moisture to work with, and as much as 0.5 to 1.0 inch of rain could fall. Severe weather is unlikely with the frontal passage. This time, the front will be deep enough to scour clouds from the region. Tuesday, and at least part of Wednesday, should see partly to mostly sunny skies. These will be fine winter days, with highs in the low- to mid-60s. Tuesday night will be cool, perhaps getting down to around 40 in Houston, but by Wednesday night things will be warming up as the onshore flow resumes. Clouds return, as the onshore flow kicks in, and high temperatures return into the low 70s. 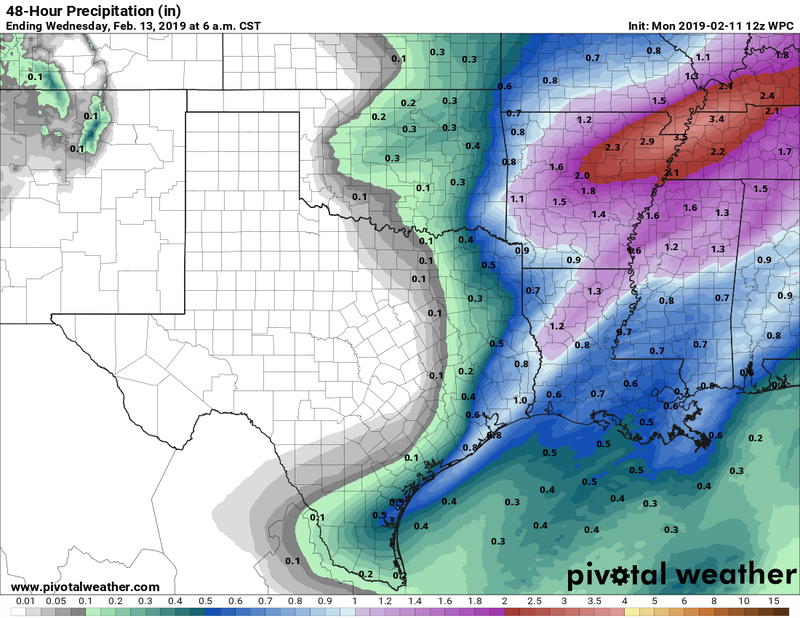 But at this point there doesn’t appear to be enough moisture for much (if any) rain. If you have special date plans for Valentine’s evening, at this point conditions look mild, with temperatures in the 60s. Just don’t count on seeing the Moon or stars. Another cold front moves in on Friday, and while we can’t entirely rule out some precipitation with it, right now this looks like a dry passage. Highs Friday will transition from the 70s to overnight lows probably in the upper 40s after the front moves through. As mentioned, the weekend looks pretty darn nice. 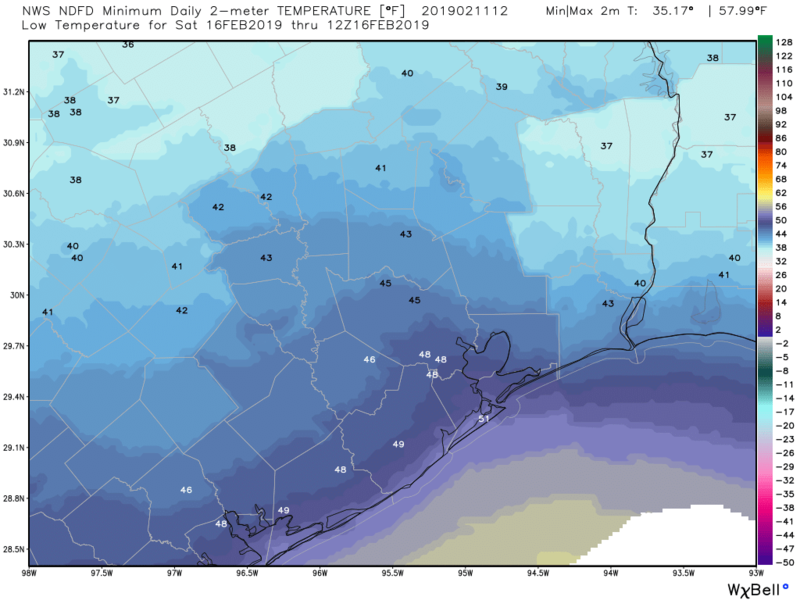 In the wake of the front, we should see partly to mostly sunny days, with highs somewhere in the 60s, and moderate overnight temperatures getting down to around 50 degrees in Houston—cooler inland, and warmer near the coast. The weekend forecast isn’t entirely locked in yet, but it’s looking good. A stronger cold front appears likely to move through early next week, bringing significantly colder weather back to the area. We can’t rule out a freeze around the 19th or 20th Houston’s inland areas, so if you’re thinking about your garden, proceed with some caution. Winter isn’t done yet. 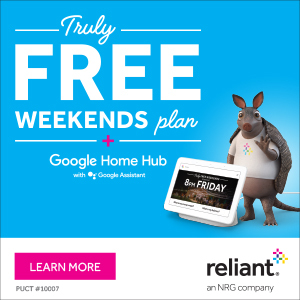 Houston, are you ready for some sunshine? Hi! Any prediction about last freeze probabilities, r.e. gardens and plants? Thanks! I know it’s still a couple weeks ahead but any predictions on Mardi Gras weather? Best guess is gray, decent rain chances, highs in the 60s. But too far out for much confidence yet.